The first collaboration between these two sonic innovators brings us a spirited brain twisting guitar freakout of the highest order with a full-on jazz-rock ensemble in attendance. Henry Kaiser is a name that should be well known to all followers of Cuneiform, as the California based guitarist has released numerous albums on that label, as well as many others, each as unpredictable and eclectic as the next, plus outstanding collaborations like Live, Love, Larf & Loaf with John French, Fred Frith, and Richard Thompson, and The Mistakes, alongside Mike Keneally, Andy West, Prarie Prince, and Buckethead. While not as well known as Kaiser, British guitarist Ray Russell has a long career as a session musician and composer, going all the way back to the 60s, with studio credits including McCartney, Bowie, Lulu, Gill Evans, Tina Turner, Phil Collins, Marvin Gaye, and many more. He has also left his mark on numerous film soundtracks throughout the years, and has still had time to release a string of albums under his own name beginning with Rites and Rituals in the early 70s. 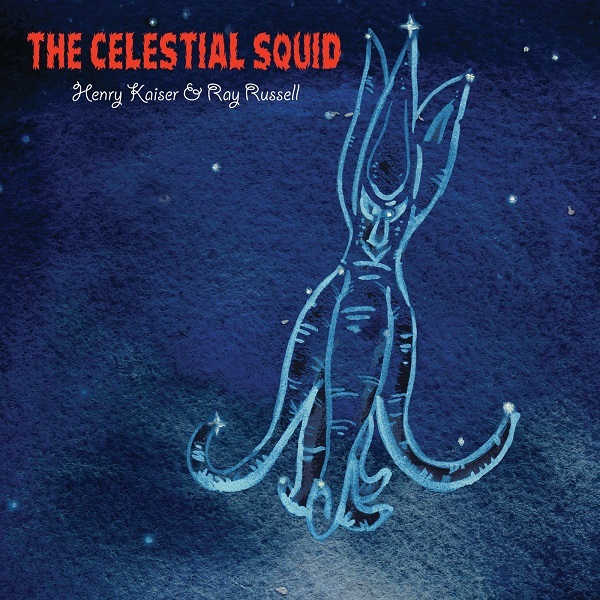 While The Celestial Squid offers seven inspired numbers, most near or breaking the ten-minute mark, partly composed and part improvised – and often both together, bravely straddling the poles of order and chaos, it’s a completely listenable journey, in part because it’s so innovative, reaching for cosmic extremes at every turn. Those along for this journey include fretless bassist Michael Manring, upright bassist Damon Smith, drummers Weasel Walter and William Winant, and a cache of brilliant sax players in Steve Adams, Aram Shelton, Phillip Greenlief, and Joshua Allen. There’s a lot here to absorb, and it goes in a lot of different directions all at the same time; don’t expect it to all sink in on the first few plays, but persistence pays off, and The Celestial Squid will certainly reward the listener with a fun romp through rockin’ free jazz territory.